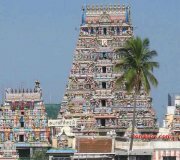 Chennai Mylapore Kapaleswarar Temple Photos, temple is dedicated to the Hindu Lord Shiva also known as Adi Bhagwan of Dravidians. The Vijayanagara kings rebuilt the temple during the 16th century and added the majestic 37m gopuram. The presiding deity of this temple is a form of Shiva called Kapaleashwarar. The form of Shiva's wife Parvati at this temple is called Karpagambal.